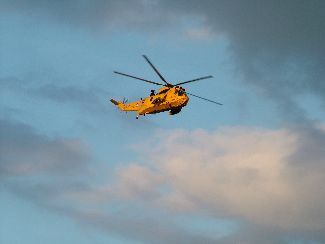 Less than a week after his wedding, Prince William was part of a Sea King helicopter team from Anglesey which rescued a 70 year old walker on Snowdon, according to RAF Valley. The search and rescue helicopter flew the man, who was understood to have suffered a heart attack, to Ysbyty Gwynedd in Bangor. This rescue was followed by a second mission when Prince William's team picked up four men, off Crib Goch (3,560 feet), one of whom is believed to have been suffering from vertigo. After days of wild guesses as to whether Will and Kate would be on honeymoon or back to Anglesey, this latest rescue ends the speculation. Meanwhile residents of south west Anglesey near where Will and Kate have a cottage, are having to endure an army of hungry paparazzi turning up at local shops, desparate for a speculative photo opportunity. Now is the time to allow the Duke and Duchess of Cambridge some quiet, quality time after the recent hectic build-up to their wedding. For more local articles, subscribe to our free Anglesey Newsletter here. It's as easy as 1-2-3!